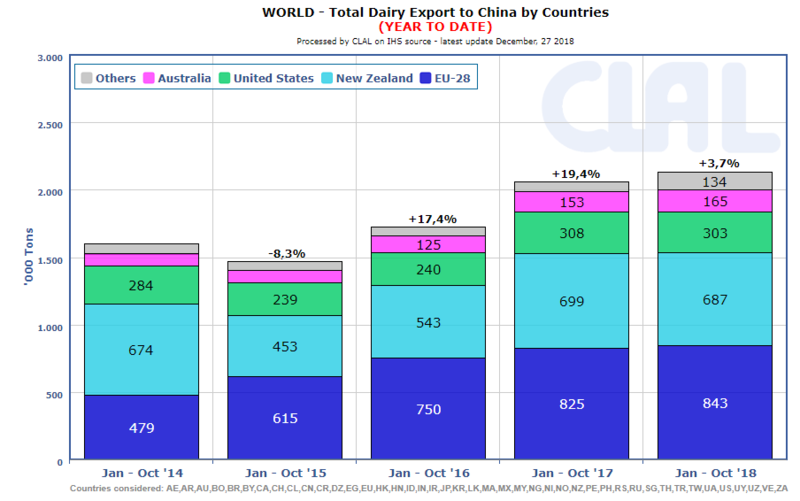 EU-28 remains the main supplier of China (view graph), followed by New Zealand, which has declining export quantities in the first 10 months of 2018, compared to the same period of last year. The US export remains stable despite the tensions on duties following the trade tensions between Washington and Beijing. In October China increased its import by 12,4% thanks to the favourable quotations, grown by 1.5% on a trend basis. Powders, pharmaceutical use lactose and packaged milk lactose have increased significantly, while infant formula decreased. Looking at the cumulative data for the period January-October 2018, China increased overall imports by 3.6% in quantity and by 6.5% in value. Milk and cream are the main imported products (in quantity), which however lose ground (-5.8% in volume and -2.2% in value) on a trend basis. Positive trends for infant formula (+20.3% in quantity and + 8.8% in value), with the European Union which recorded a growth of 20% in the first 10 months of 2018 and which accounts for 78% of the market share, followed by Australia and New Zealand. Increases are recorded also for butter (+26.4% in quantity and +27.8% in value), caseinates, lactose for pharmaceutical use and for food use. During the first ten months of 2018 the increase in imports is far from the preceding two-year purchases (respectively + 19.4% and + 17.4%). 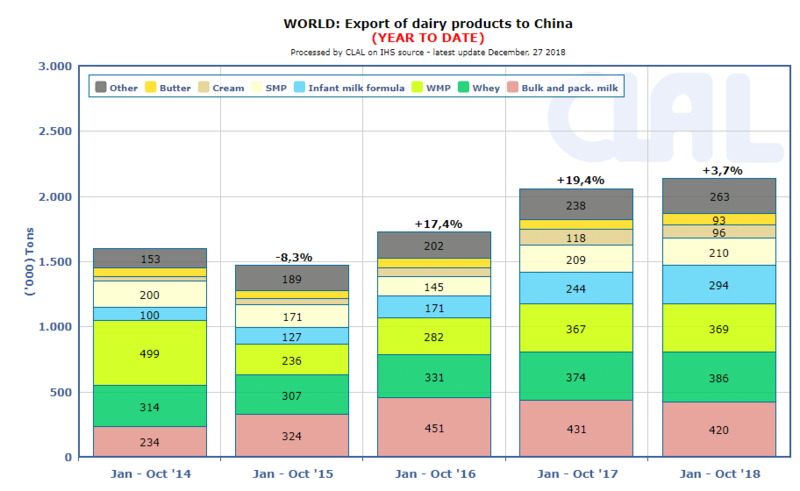 The Chinese import continues to increase although at a lower pace and without giving precise indications on the dairy products that China intends to purchase. In some situations, it may store powders and in some others butter or milk infant formula. Therefore, in this context the wisest approach remains maintaining good business relations.